It states that energy can neither be created nor destroyed in any process. It can only be converted from one form to another but the total amount remains constant. Note that when mentioning the energy conversion, have to be more specific by stating the subject. At A, when the pendulum bob is displaced to one side, it gains GPE, i.e max GPE and 0 KE. When it is released, GPE is converted to KE as it swings down. At B, it has both GPE and KE. At C, when it returns to its original position, all GPE is converted to KE so it has max KE and 0 GPE. As it swings to the opposite side, KE is converted to GPE. At D, all KE is converted to GPE so it has max GPE and 0 KE. Ideally, the pendulum will swing to and fro forever. GPE is continuously converted into KE and vice verse. The total energy of the pendulum remains constant throughout. Note that ideally, the maximum height reached at D is same as the initial height displaced at A. To help you understand this better, you can play with the applet below. Make sure the simulation is on the tab Introduction. Select the Bar Graph, Grid and Speed boxes on the top right corner. Click and drag the skater to a height of 4.0 m on the ramp’s left side, and then release. From Bar Graph, at highest point (4.0 m), there is only GPE (maximum GPE) while at the lowest point, there is only KE (maximum KE). Also, the total energy remains the same throughout. There is no thermal energy in this case because no friction introduced here. From speedometer, at highest point, speed is 0 while at the lowest point, speed is highest. The maximum height reached on the ramp's right side is also 4.0 m, which is same as the initial height. Caution: do not reset the simulation! Now, move the slider on Skater Mass to the right to have larger skater mass. From Bar Graph, the value of GPE, KE and total energy increases due to larger mass. Although KE is higher in this case, ﻿speed is the same﻿ as before observed from Speedometer! A very important concept here!! Why is it so? From this formula, you should be able to conclude that speed only depends on height and gravitational field strength, g when there is no friction or air resistance (in some cases). Due to air resistance, some energy is lost as heat which is dissipated to the surroundings. As a result, the height reached at D is lower than the initial height at A. Subsequently, it will reaches a lower and lower height and eventually come to rest at C.
Although the pendulum comes to rest at the end, principle of conversation of energy still applies as all GPE gained at A is converted to heat (thermal energy) which is dissipated to surrounding. To help you understand this better, you can again play with the same applet (can be found above) as before. 1. Select the "Friction" tab on the top of the simulation. 2. Again, select the Bar Graph, Grid and Speed boxes on the top right corner. 3. Select "On" below Friction on the right to add the element of friction to the ramp, make sure the friction level is set to “none”. 4. 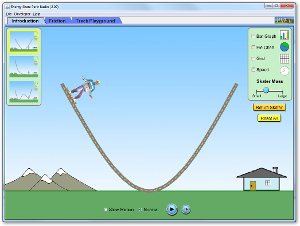 Click and drag the skater to a height of 4.0 m on the ramp’s left side, and then release. 5. You should be able to observe what you have observed previously if you played this applet before. If no, you should play it first to have a better understanding here. Detailed steps can be found above. From simulation display, the height reached by the skater gradually decreases and eventually the skater stops at the bottom. From Bar Graph, the GPE and KE gradually decreases and thermal energy gradually increases when the skater moves around. However, the total energy remains the same throughout the journey. At the end, thermal energy is same as the total energy and the skater stops at the bottom. The Figure below shows part of the route of a roller-coaster in which the passenger car pulled up to point A and released. During one run, a car and passengers of total mass 800 kg are released from rest at point A, a height of 30 m above the terminal platform. The car travels a distance of 120 m along the track to reach the highest point B of the vertical loop which is 20 m above the terminal platform. A constant frictional force of 250N acts between the car and the track as the car moves from A to B. (iv) the speed of the car at B. (b) In the design of the roller coaster, do you think the summit C can be higher than point B? Explain briefly.